Military technology decades apart meet as a Finnish military tractor carrying reservists on a cart passes PstOhj 2000 (Eurospike) team covering the road. Spike missile originates from Israel but its now being marketed and produced in Europe as a joint venture called the Eurospike. The system is fire-and-forget capable and it is able to defeat reactive armor with its tandem warhead. 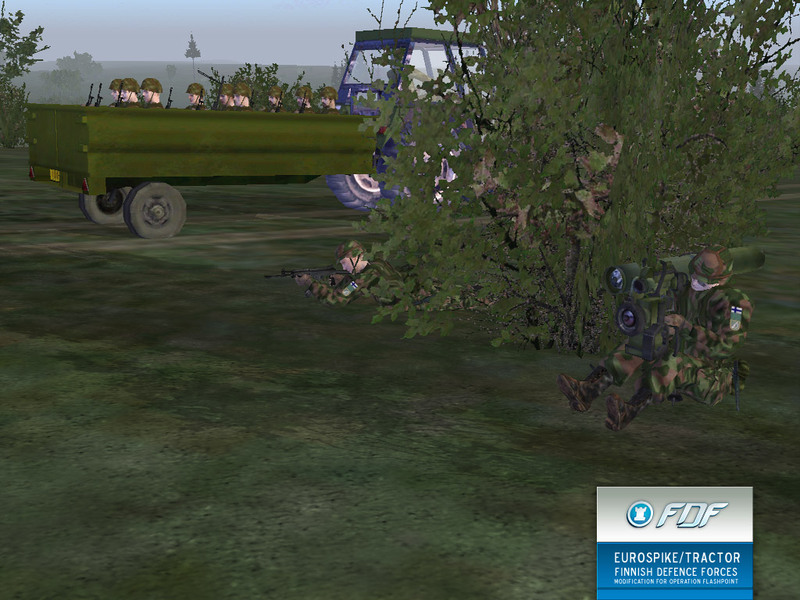 The Eurospike has been adopted in the early 2000s by at least Poland, Holland and Finland as their medium-range anti-armor system. Copyright © 2002- FDF Mod Dev Team. Logo by Jazmon. Contact information. Lisää tehtäviä ja kampanjoita löydät FDF Mod Mission Repositorysta. More missions and campaigns at FDF Mod Mission Repository. Site theme built on template by Geckoandfly.